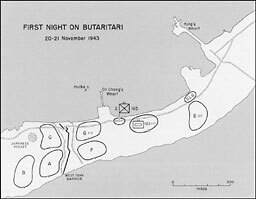 In the initial landings on Butaritari a platoon of Company C, 102d Engineers, was attached to each of the infantry battalion landing teams. One squad of each platoon was distributed over the first-wave boats of the assault companies and came ashore prepared to clear beach and underwater obstacles with Bangalore torpedoes. The remainder of the platoon of engineers landed with the reserve of the infantry battalion landing team. Shore parties were furnished by the 152d Engineers. Company A was attached to the 3d Battalion Landing Team at Red Beach 2, Company B to the 1st Battalion Landing Team at Red Beach 1, and Company C to the 2d Battalion Landing Team at Yellow Beach. 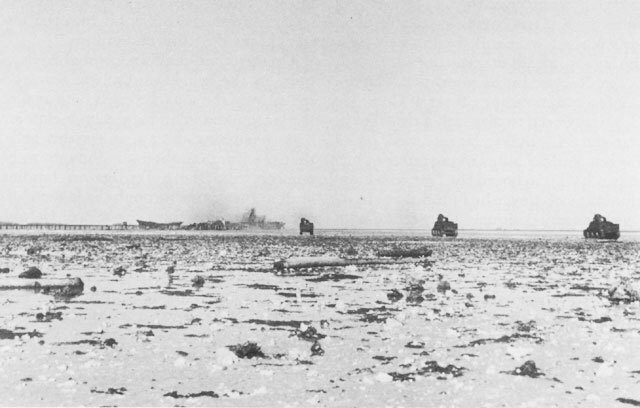 More serious was the fact that during the first day of landing no direct radio communication was established between the 1st and 3d Battalion Landing Teams on Red Beaches and the 2d Battalion Landing Team on Yellow Beach, although previous arrangements had been made for this by the allocation of an appropriate frequency and the assignment of necessary radio sets. Late in the day, it is true, occasional messenger service connected the 2d Battalion Landing Team with the rest of the force on the west end of the island, but not until the morning of the second day of operations was full radio, wire, and messenger service established between Red and Yellow Beaches.4 In view of the fact that these two forces were approaching each other in a delicate maneuver that required precise timing and complete coordination, the absence of direct radio contact between them was a serious handicap. By the time action against the enemy had been closed in the late afternoon of 20 November, the first objectives of the invasion of Makin had in the main been accomplished. Except for the small pocket contained by Company C, the West Tank Barrier system had been reduced. Other secondary aims had also been realized. A solid holding line facing east had been established, and the likelihood of any substantial Japanese reinforcement of the West Tank Barrier reduced to a minimum. Beachheads had been secured on two shores and were in process of development. Artillery was ashore and had already fired a few missions in support of Company E's advance eastward. All command posts were ashore except the division's. 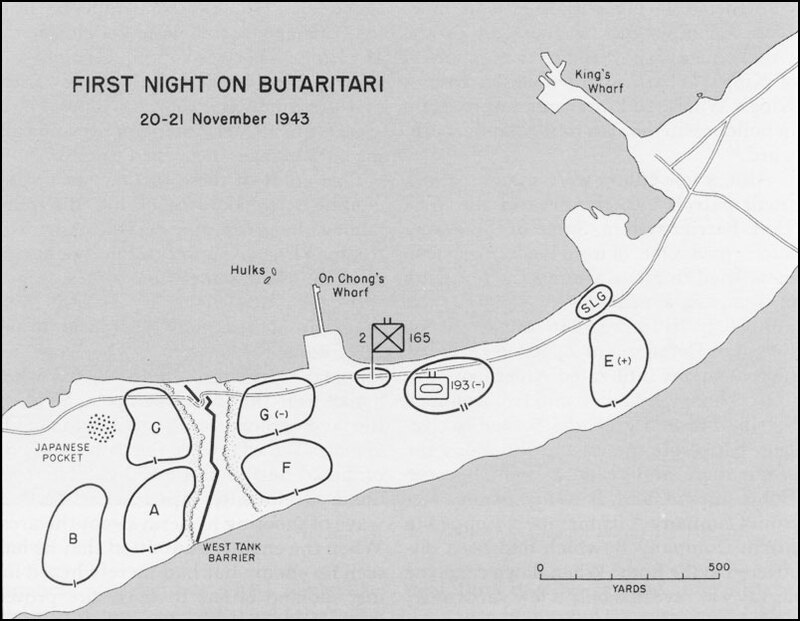 With the virtual reduction of the West Tank Barrier, the troops facing the main body of Japanese on the eastern part of the island automatically became the front-line units. The principal element in the east on the night of D Day was Company E, reinforced by one platoon of Company G and a part of Detachment Z of the 105th Infantry, one of the special landing groups. M3 Medium Tanks shell the hulks off On Chong's Wharf. Japanese still held a small wedgelike pocket just northwest of the barrier and from that position could bring guns to bear on the east-west highway, which was now the main supply route from Red Beaches. Also, the approaches to Yellow Beach were not yet secure, and any attempts to bypass the pocket by bringing supplies through the lagoon would be handicapped by fire from the west. 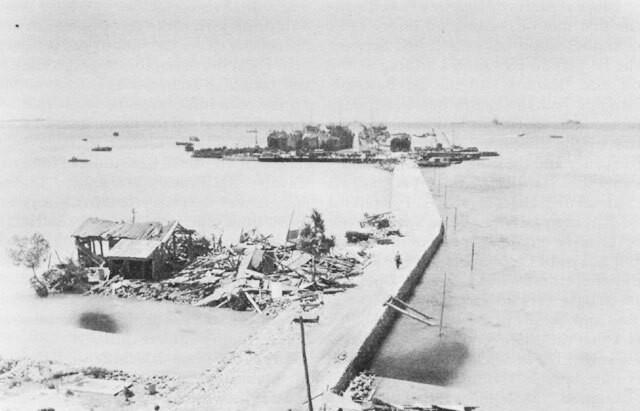 The two hulks on the reef near On Chong's Wharf, which had been so heavily attacked from the air and sea on D Day, were once more believed to be occupied by the enemy. With all this conflicting testimony, it is impossible for the historian to reach any final conclusion except to say that the weight of the evidence would seem to indicate that the hulks had been unoccupied by the enemy from the very beginning of the operation. In any case, it is certain that after the investigation conducted by Lieutenant McGinley, no more fire was heard from the hulks or the area near them. The liveliest action in the West Tank Barrier zone occurred in a coconut grove along the eastern edge of the barrier clearing, just north of the middle of the island. About 1030 a group of Japanese began firing rifles and light machine guns into the platoon of Company F that was mopping up along the former stronghold. Captain Leonard asked for three light tanks to come up and give him help. The tanks, after reporting, moved over to the highway, which skirted the northern edge of the clearing, so that their line of fire was toward the ocean. While the tanks were spraying the tree tops with machine gun fire and canister they were approached by a fourth towing fuel along the highway. After the latter's tow cable snapped it also joined the other tanks in the attack. This episode at the tank trap closed the action at the West Tank Barrier. No further important difficulty was encountered with enemy stragglers in that zone. Attention could now be fully centered on the drive eastward to secure the remainder of the island. 1. Makin Task Force Engineer (Col Brendan A. Burns), Rpt and Recommendations, 20 Dec 43, pp. 1-2. 2. USS Calvert Action Rpt, 28 Nov 43, pp. 3-4; USS Leonard Wood Action Rpt, 20 Dec 43, p. 4. 3. 27th Inf Div Rpt of Participation of TF 52.6 in GALVANIC (hereafter cited as TF 52.6 GALVANIC Rpt), p. 3; Signal Officer 27th Inf Div Task Force (Lt Col Thomas J. Murray), Summary of Signal Communications During the GALVANIC Operations of 27th Inf Div Task Force, p. 3; Ltr, Maj Rex R. Stillwell, USMC, to G-3 V Phib Corps, 4 Dec 43, in V Phib Corps GALVANIC Rpt, Incl F, Rpt by Special Staff Officers, Sec. V, p. 2. 4. Signal Officer 27th Inf Div Task Force, Summary of Signal Communications, GALVANIC, p. 3. 5. 27th Inf Div G-3 Msg File, G-2 Msg File, passim; Ltr, Maj Stillwell to G-3 V Phib Corps, 4 Dec 43, in V Phib Corps GALVANIC Rpt, Incl F, Rpt by Special Staff Officers, Sec. V, p. 2. 6. TF 52.6 GALVANIC Rpt, pp. 2-3. 7. ALP U-13, attached to 3d BLT, was in position ashore by 0910; ALP U-11, attached to 1st BLT, by 1110; ALP U-12, attached to 2d BLT, was held up off Yellow Beach by the air attack against the hulks but was landed by 1258. V Phib Corps GALVANIC Rpt, Incl F, Special Staff Officers Rpt, Sec. 1, Air Officer Rpt, pp. 3-4. 8. Ltr, 27th Inf Div Artillery Officer (Col Harold G. Browne) to CTF 52.6, 7 Dec 43, sub: Rpt on Naval Gunfire in Makin Opn, p. 2, AG 327 Art 0.3.0 (22866), DRB AGO; Fifth Amph Force Rpt, Capture of Gilbert Islands, Incl H, p. 4. 9. V Phib Corps GALVANIC Rpt, Incl F, Special Staff Officers Rpt, Sec. I, Air Officer Rpt, pp. 3-4. 10. Ibid. ; Ltr, Maj Stillwell to G-3 V Phib Corps, 4 Dec 43, p. 2. 11. Signal Officer 27th Inf Div Task Force, Summary of Signal Communications, GALVANIC, p. 4; TF 52.6 GALVANIC Rpt, p. 8; Ltr, 1st Lt James B. Sullivan to Lt Col Arthur W. Tyson, 7 Dec 43, sub: Observations on Makin Island Opn, p. 4. The report of Admiral Turner's communications officer is far less sanguine in its estimates of the efficiency of communications ashore than are the official Army reports. It reads, in part, "Landing Force Communications ashore were largely non-existent. There were no beach laterals and no command channels. Some breakage of equipment, delays in loading, usual losses and confusion and a lack of command organization appear to be the major causes of an outstanding lack of communications. Equipments which were finally gotten ashore and in working condition were not utilized on channels as planned." Fifth Amph Force Rpt, Capture of Gilbert Islands, Incl D, pp. 7-8. 12. 27th Inf Div G-3 Jnl, 20 Nov 43, Msg 95. 13. 165th Inf Regt Combined Jnl, 20 Nov 43, Msg File, Msg 22. 14. 1st Bn 165th Inf Regt Combined Jnl, 20 Nov 43, Msg 16. 15. 27th Inf Div G-3 Jnl, 20 Nov 43, Msg 95. 16. Baxter, Armored Force Action on Makin, pp. 10-14. 17. 27th Inf Div G-3 Msg File, 20 Nov 43, Msgs 86-91. 18. Baxter, Armored Force Action on Makin, pp. 10-14. 19. 27th Inf Div G-2 Periodic Rpt, Rpt 1, 20 Nov 43. 20. Interv, Capt Ferns, Marshall Intervs, pp. 55-58. 21. Interv, Capt Ryan, Marshall Intervs, pp. 39-41. 22. Interv, Capt Ferns, Marshall Intervs, pp. 55-58. 23. Marshall, Makin Notes, p. F14. 24. Interv, 1st Sgt Bartholomew Mooney, Marshall Intervs, pp. 20-21. 25. Intervs,Capt Ben Krugman and Sgt Mooney, Marshall Intervs, pp. 9-10, 14, 20-21. 26. Marshall, Makin Notes, p. F45; Durand, Rpt on Makin Island Expedition, p. 4. 27. V Phib Corps GALVANIC Rpt, Incl F, Rpt by Special Staff Officers, Sec. I, Air Officer's Rpt, Incl A, pp. 6-8. 28. 27th Inf Div G-4 Jnl, 21 Nov 43, p. 5. 29. Marshall Intervs, p. 37. 30. Durand, Rpt on Makin Island Expedition, p. 2. 31. Marshall, Makin Notes, p. F42. 32. Ibid. ; Interv, Edmund G. Love with Col Gerard W. Kelley, Sep 47; Ltr, S.L.A. Marshall to Dr. Kent Roberts Greenfield, 2 Apr 52, OCMH. 33. Marshall, Makin Notes, p. F17. 34. 1st Bn 165th Inf Regt Combined Jnl, 21 Nov 43, Msg 8. 35. Marshall, Makin Notes, p. F17. 36. Interv, Lt Robert Welch, Marshall Intervs, pp. 32-33; Marshall, Makin Notes, pp. F43, EE6-EE7.